He died for His country and His God. Virgil Guerry Craig was but a young man when he was taken by sickness toward the end of World War I. His WWI draft registration card states he was a student at the State College of Agriculture in Athens, GA in 1918. He was described as tall and slender with brown eyes and brown hair. Though I do not know for certain if Virgil enlisted or was drafted, I do know he never saw combat. In fact, he never even left the United States. Virgil had only been a member of the Student's Army Training Corps for approximately 17 days when he died. The cause of Virgil's death was either influenza or pneumonia (both? ), as reported in the Macon Telegraph on 19 October 1918 and The Atlanta Constitution on 18 October 1918. ...So far there have been only three deaths from influenza in Athens, one of them a soldier patient, Virgil G. Craig, attending the University Army Training School. His home was at Lawrenceville. Lawrenceville, Ga., October 17 -- (Special.) 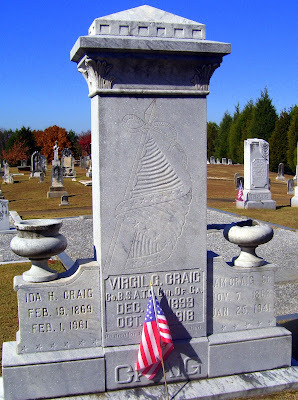 Virgil G. Craig, age 19, died at the University of Georgia this morning of pneumonia. He enlisted in the chemical engineers S. A. T. C. October 1. His remains were brought here on the afternoon train and funeral and interment will be at Fairview Friday at 3 o'clock. He is survived by his father and mother, Mr. and Mrs. Samuel Craig; two brothers, Samuel, Jr. and Fred Craig, and one sister, Miss Vera Mae Craig. Virgil's parents (Ida H., 1869-1961, and Sam, 1863-1941) rest with him at Fairview. Fairview Presbyterian Church Graveyard (Lawrenceville, Gwinnett County, Georgia). Grave markers. Georgia. Macon Telegraph. 19 October 1918. Georgia. The Atlanta Constitution. 18 October 1918. "World War I Draft Registration Cards, 1917-1918." Images. Genealogy, Family Trees and Family History Records online - Ancestry.com. http://www.ancestry.com : 2011.